The Victorian manor house lives on in Medindie. As property owners take up the developer’s offer to truncate deep blocks and transform tennis courts into expensive infill housing, the footprint of Victorian manor houses has steadily reduced. Tectvs sought to do the opposite: good architecture should remain a standard, but the 21st century can't be ignored. Through careful and detailed architectural intervention, Johnson House turned from Victorian manor to modernist icon. Grand old houses are also not well suited to modern lifestyles where light and transparency is valued, not kept at bay. The confining maze of rooms typical of 19th century homes has often been exacerbated by regular additions and changes in use generated by attempts to mould the past to the present. The large, rambling Johnson home, of Victorian red brick and occasional Queen Anne detailing, was such a rabbit warren of spaces, a constraining environment for teenage children and a level of family interaction which could scarcely have been imagined at its conception. Tectvs was asked to design a solution that brought every day living into the new millennium without diminishing an enduring marker of the past; to mitigate the passage of time and celebrate heritage and meaning. The existing house would be maintained and upgraded internally as bedrooms and private spaces for contemplation, rest and sleep, a retreat for individuals aligned with the introspective character of the building’s traditional design and layout. A new structure would be the centre of activity and interaction. It would be open, transparent and outward looking - a place for living in the modern sense. One would be an exhibition piece, the other a public interface. For the addition Tectvs revisited the ethos of one of the founding fathers of modernism; Mies van der Rohe. Mies sought an architecture of minimal structural framework balanced against the freedom of free-flowing open space, describing his approach as "skin and bones" architecture. From the 1920's onwards Mies had explored the use of industrial materials such as glass and steel in his quest for the optimal extension of space around and beyond interiors. However, the technology of his time prevented him from achieving his ultimate transparency of form: glass as structure. The glass technology of today, and the support of a structural-engineer client with an interest in glass as a structural element, enabled Tectvs to apply the spirit of Mies to both reveal and conceal the original house, frame views previously obscured, and open up views of the world beyond a rear boundary considerably foreshortened from that of earlier days. Glass and water provide the architect with the tools of reflection and deception to extend depth of field and project the perception of space. Tectvs designed a pool at the rear of the addition to give the impression it flowed under the glass box hovering above, and to allow the play of light on glass and water to bring the outside in and project the inside beyond its physical boundaries. One criteria for Tecvts was to ensure the new forms made minimal impact on the visual harmony of the historic neighbourhood. 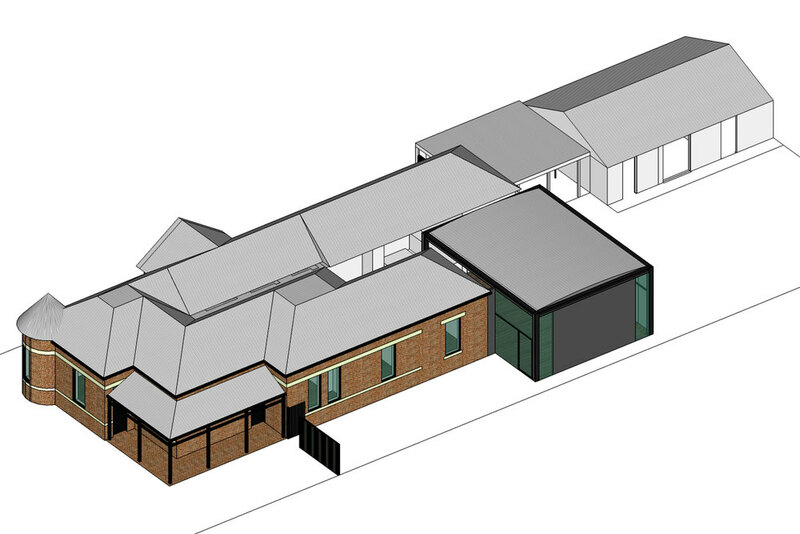 The addition was set slightly to one side of the rear of the house, rendering it almost invisible from the street.